We offer a complete solution for utility bill processing and data management. EnergyCAP’s Bill CAPture service meets your data entry, auditing, and reporting needs while saving you time and improving your bottom line. Utility invoice formats and accessibility vary widely from vendor to vendor. 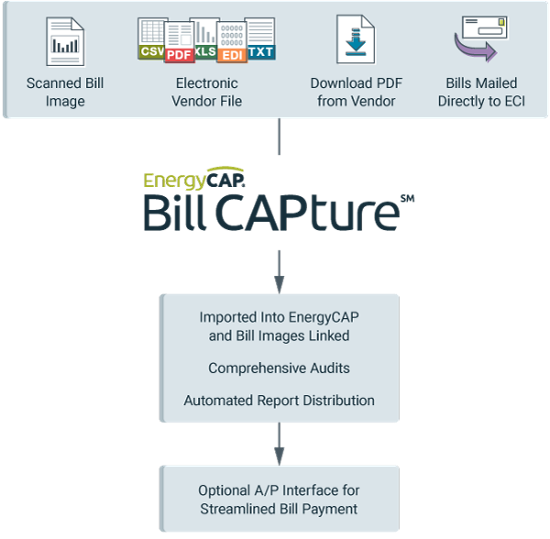 Through the use of industry-leading technologies, EnergyCAP’s Bill CAPture processes utility bills in a variety of formats: scanned images and PDFs (via FTP or website download), EDI 810 files, other data files (XLS, CSV, TXT, etc. ), and paper bills mailed to us.